Do you wish you could have a whole new smile? Or maybe you just have one tooth you wish you could just replace. 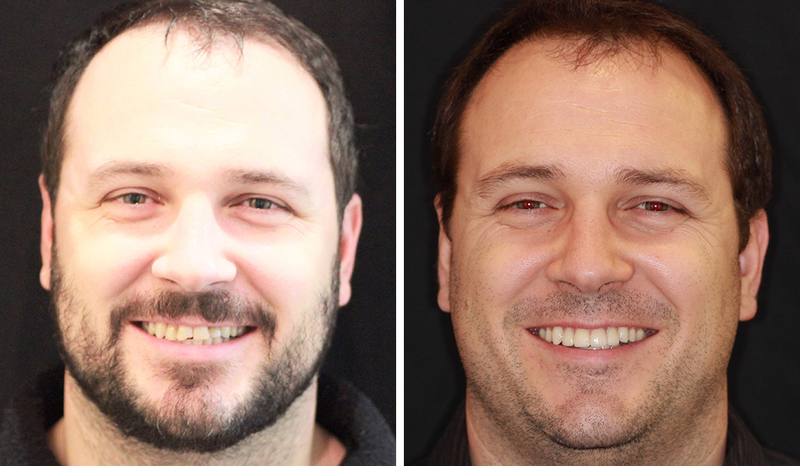 With porcelain veneers, you can do either of these. Porcelain veneers can give you an attractive smile, even if you’re looking to correct many issues at once: discolored teeth, chipped teeth, crooked teeth, and more can call be fixed with porcelain veneers in New City. It only takes one relatively quick procedure. Essentially, porcelain veneers are able to improve virtually any complaint you have about the appearance of your smile, short of missing teeth. That requires dental implants or bridges! In many situations, porcelain veneers are better than other options for giving you the results you desire. Teeth whitening starts to fade as soon as it’s done. While we can maintain the whiteness level, it does take constant care. Many teeth just won’t respond to whitening, especially if they’re stained within the teeth. Dental bonding is a good way to address minor chips, cracks, and gaps between teeth, but porcelain veneers are even better. That’s because porcelain veneers can be more attractive than dental bonding. The advanced ceramic is closer in appearance to natural tooth enamel. And it’s stronger than dental bonding. Porcelain veneers can be used in situations where bonding won’t work, and it will last longer. The biggest drawback to veneers is their cost. They’re typically much more expensive than bonding. But they’re often worth it! When porcelain veneers are used to straighten teeth, they’re often described as “instant orthodontics.” That’s because they can straighten your teeth in about a month, compared to the year or more it takes for traditional orthodontics. But they have another benefit: you don’t have to wear a retainer. Porcelain veneers don’t move your teeth roots, so they don’t create instability in your teeth. If veneers are placed properly with good occlusion, your teeth won’t drift. Getting porcelain veneers begins with a consultation where we discuss your cosmetic goals and design your results. Once we’ve decided on the best way to achieve your desired results, we’ll prepare your teeth to receive the porcelain veneers. This involves removing a small amount of tooth enamel. This is about half a millimeter. Although the amount depends on how much your teeth are being reshaped. We’ll take impressions of your prepared smile and send these off to the lab where your custom veneers will be crafted. Then we’ll fit you with temporary veneers. When your permanent veneers are ready, we’ll test them out to make sure the results are what you’re looking for. We may make minor adjustments, then permanently cement them to your teeth. You might think porcelain veneers are fragile, but they’re not. They’re actually much stronger than your natural tooth enamel. This means that, with proper care, they will likely last ten years or more; most last more than twenty years! So what does proper care mean? It means taking care of bite issues, like bruxism, that can damage veneers. It means not using your teeth as tools, not chewing on non-food objects, and always wearing a mouthguard when playing sports. It also means taking care of your teeth. Veneers need your teeth to stay healthy. We will also let you know which toothpastes might be too abrasive for your veneers.